For New Zealand's highest peak, see Mount Cook. Yukon Territory, Canada—Yakutat City and Borough, Alaska, U.S.
Mount Cook (or Boundary Peak 182) is a high peak on the Yukon Territory-Alaska border, in the Saint Elias Mountains of North America. It is approximately 15 miles southwest of Mount Vancouver and 35 miles east-southeast of Mount Saint Elias. It forms one of the corners of the jagged border, which is defined to run in straight lines between the major peaks. The same border also separates Kluane National Park in the Yukon Territory from Wrangell-St. Elias National Park and Preserve in Alaska. Like many peaks of the Saint Elias Mountains, Mount Cook is a massive peak, with a large rise above local terrain. For example, the southwest face drops 10,000 feet (3,048 m) to the Marvine Glacier in approximately 4 miles (6.4 km). It is also quite close to tidewater: Disenchantment Bay is less than 18 miles (29 km) from the summit. Mount Cook was first climbed in 1953. It is not often climbed due to its remoteness, the size of the mountain, the typically poor weather (due to its proximity to the ocean), and the fact that it is not one of the highest peaks of the range. In fact there are only four references to the peak in the complete index of the American Alpine Journal. ^ This is according to bivouac.com, the Canadian Mountain Encyclopedia, quoting the Canadian NTS map. The USGS map has an elevation that is 6 feet lower. ^ According to bivouac.com, the NTS map shows the high point substantially north of the international border (much as with Mount Vancouver). The USGS shows the summit to be right on the border. ^ a b "Yukon, Northwest Territories and Nunavut Ultra-Prominences". Peaklist.org. Retrieved 2013-01-13. 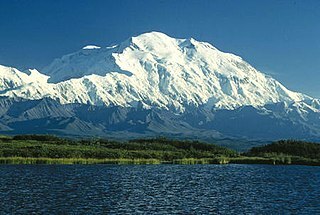 Mount Logan is the highest mountain in Canada and the second-highest peak in North America, after Denali. The mountain was named after Sir William Edmond Logan, a Canadian geologist and founder of the Geological Survey of Canada (GSC). Mount Logan is located within Kluane National Park Reserve in southwestern Yukon, less than 40 kilometres (25 mi) north of the Yukon–Alaska border. Mount Logan is the source of the Hubbard and Logan glaciers. Logan is believed to have the largest base circumference of any non-volcanic mountain on Earth, including a massif with eleven peaks over 5,000 metres (16,400 ft). Mount Saint Elias, also designated Boundary Peak 186, is the second highest mountain in both Canada and the United States, being situated on the Yukon and Alaska border. It lies about 42 kilometres (26 mi) southwest of Mount Logan, the highest mountain in Canada. The Canadian side is part of Kluane National Park and Reserve, while the U.S. side of the mountain is located within Wrangell-St. Elias National Park and Preserve. Mount Vancouver is the 15th highest mountain in North America. Its southern side lies in Glacier Bay National Park and Preserve at the top of the Alaska panhandle, while its northern side is in Kluane National Park and Reserve in the southwestern corner of Yukon, Canada. Mount Vancouver has three summits: north, middle, and south, with the middle summit being the lowest. The south summit, Good Neighbor Peak at 4,785 m (15,699 ft), straddles the international border while the north summit is slightly higher at 4,812 m (15,787 ft). Mount Augusta, also designated Boundary Peak 183, is a high peak of the Saint Elias Mountains on the border between the U.S. state of Alaska and the Canadian territory of Yukon. Mount Crillon is a high peak of the Fairweather Range, the southernmost part of the Saint Elias Mountains. It lies southeast of Mount Fairweather, in the promontory between the Gulf of Alaska and Glacier Bay. It is included in Glacier Bay National Park. The peak was named after Felix-Francois-Dorothee de Bretton, Comte de Crillon, by his friend, the French explorer Jean Francois de Galaup de la Perouse. Mount Bona is one of the major mountains of the Saint Elias Mountains in eastern Alaska, and is the fifth-highest independent peak in the United States. Mount Bona and its adjacent neighbor Mount Churchill are both large ice-covered stratovolcanoes. Bona has the distinction of being the highest volcano in the United States and the fourth-highest in North America, outranked only by the three highest Mexican volcanoes, Pico de Orizaba, Popocatépetl, and Iztaccíhuatl. Its summit is a small stratovolcano on top of a high platform of sedimentary rocks. Mount Churchill is a volcano in the Saint Elias Mountains and the Wrangell Volcanic Field of eastern Alaska. Churchill and its higher neighbor Mount Bona about 2 mi (3 km) to the southwest are both large ice-covered stratovolcanoes, with Churchill being the fourth highest volcano in the United States and the seventh highest in North America. Mount Bear is a high, glaciated peak in the Saint Elias Mountains of Alaska. It lies within Wrangell-Saint Elias National Park, about 4 miles (6.4 km) west of the Yukon border. The Barnard Glacier flows from its southwest slopes, while the Klutlan Glacier lies to the north. Its principal claim to fame is that it is a fourteener, and in fact one of the highest 20 peaks in the United States. Mount Natazhat is a high peak of the Saint Elias Mountains, of Alaska, United States, just west of the border with the Yukon Territory of Canada. It lies on the northern edge of the range, south of the White River and north of the Klutlan Glacier. Mount Natazhat is a little-noticed peak; however it is a very large peak in terms of rise above local terrain. It rises 9,000 feet (2,743 m) in less than 7 miles (11.3 km) above the lowlands to the north, and 7,500 feet (2,286 m) in about 4 miles (6.4 km) above the Klutlan Glacier to the south. 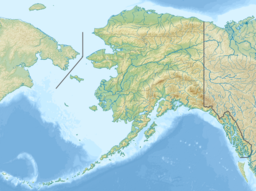 Atna Peaks is an eroded stratovolcano or shield volcano in the Wrangell Mountains of eastern Alaska. It is located in Wrangell–Saint Elias National Park about 6 miles (9.7 km) east of Mount Blackburn, the second-highest volcano in the United States, and just south of the massive Nabesna Glacier. Because the mountain is almost entirely covered in glaciers, no geological studies have been done, but published references state and the geological map shows that the mountain is an old eroded volcanic edifice. This article comprises three sortable tables of major mountain peaks of Canada. The following sortable table comprises the 150 highest mountain peaks of Canada with at least 500 metres of topographic prominence. The following sortable table comprises the 23 mountain peaks of the U.S. State of Alaska with at least 4000 meters of topographic elevation and at least 500 meters of topographic prominence. The following sortable table comprises the 19 mountain peaks of Canada with at least 4000 metres of elevation and at least 500 metres of topographic prominence. The following sortable table comprises the 67 mountain peaks of Canada with at least 3000 metres of elevation and at least 500 metres of topographic prominence. The following sortable table comprises the 11 mountain peaks of greater North America with at least 5000 meters of elevation and at least 500 meters of topographic prominence. This article comprises four sortable tables of mountain summits of Canada that are the higher than any other point north or south of their latitude or east or west their longitude in Canada.